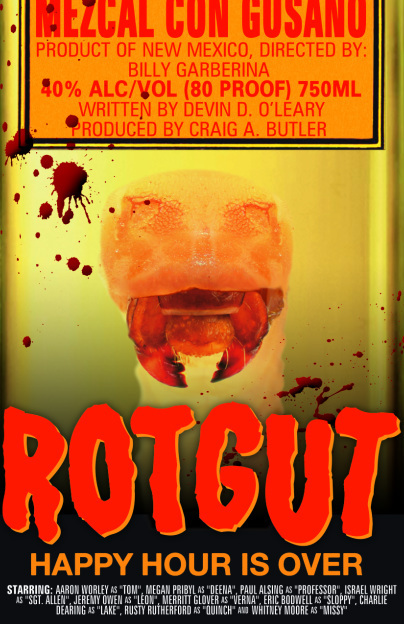 Rotgut is a feature-length horror thriller directed by Billy Garberina, written by Devin O'Leary and produced by Billy Garberina, Devin O'Leary and Craig A. Butler. The film's special effects come courtesy of self-made gore king Hank Carlson. The cast includes Whitney Moore (Birdemic), Jeremy Owen (Paul) and Israel Wright (The Stink of Flesh). The story revolves around a seedy downtown bar on a seemingly quiet Sunday morning. Arriving at the doors is the usual collection of drunks, losers and lost souls. But when a batch of very bad booze is introduced into the mix, this group of unlikely, down-on-their-heels heroes must fight back against a growing horde of mutated, brain-eating maggot creatures. Drink up quick. Because Happy Hour is over. Contact the makers of ROTGUT.